The effect of composition on the ternary (NbCr2–TiCr2) C15 phase properties has been investigated, focusing upon the defect structure, elastic properties, and mechanical behavior. The C15 phase field is continuous between NbCr2–TiCr2, with a maximum phase field width of at least 7 at.% solubility. The defect mechanism is governed by anti-site constitutional defects for all alloys. Mechanically, the alloys display a maximum in hardness in the center of the ternary phase field (and a minimum of toughness). The ternary phase field has features that are characteristic of solid-solution strengthening mechanisms. Finally, the elastic properties indicate that the alloys become stiffer in the middle of the ternary phase field. The best compromise of properties occurs furthest from stoichiometry in the ternary phase field at the nominal composition of Nb19Ti19Cr62. The relationships between the defect structure, elastic properties, and mechanical response for the C15 phases are discussed using a combination of atomic size arguments and electronic structure analyses. 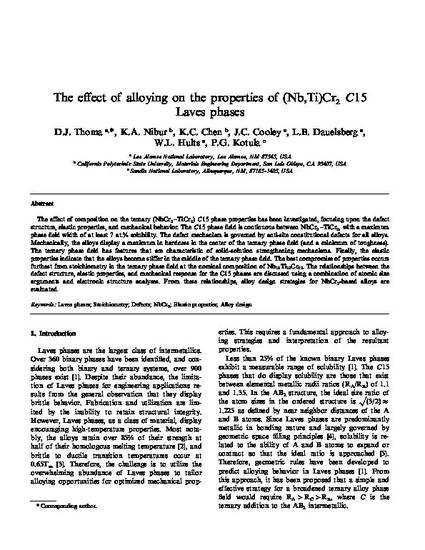 From these relationships, alloy design strategies for NbCr2-based alloys are evaluated.